Successfully Added Xiaomi Mi In-Ear Headphone Pro - Dual Dynamic Drivers, Built-In Mic, 45 Degree In-Ear Design, 4 Size Ear Plugs, 98dB to your Shopping Cart. The Xiaomi Mi In-Ear Headphone Pro lets you take the most out of all your favorite tracks by delivering absolutely stunning audio quality. This remarkable headset comes with hybrid dual-dynamic and balanced armature drivers – supporting the creation of an audiophile-grade music experience. Delivering mild and mellow tones, you will be able to enjoy an extremely full and detailed melody - truly allowing you to get absorbed into your favorite songs. Thanks to its stylish look, the Mi headphones can be worn with confidence anywhere. No matter where you’re at, from now on you’ll be able to enjoy your favorite songs like never before. 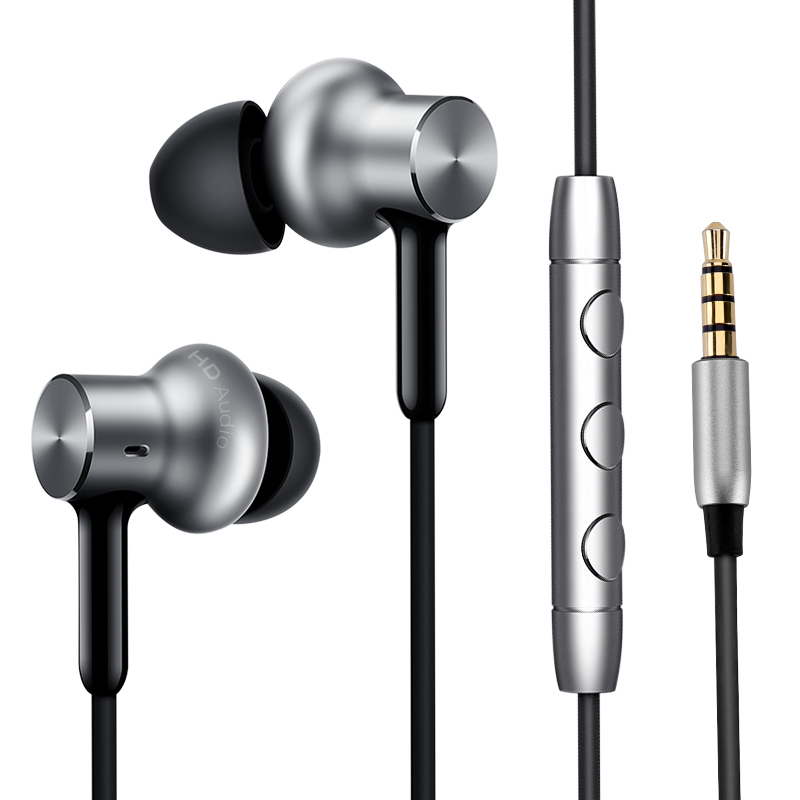 Featuring a comfortable 45-degree in-ear design, the Xiaomi Mi headphones are a guarantee fit to anybody out there. These high-end headphones come with 4 different size detachable ear-plugs in the sizes Extra Small, Small, Medium, and Large – assuring that, no matter the shape and size of your ear, these headphones will form a perfect fit. Equipped with a full-metal controller that has been intergraded within its cable, the Mi in-ear Headphone Pro lets you efficiently browse through your music library without needing to access your smartphone or music player. Additionally, this full-metal controller also features a high-end microphone – allowing you to engage in hands-free phone calls at the press of a button. Capable of producing up to 98dB, this Xiaomi headset allows you to turn up the volume and blast away your favorite songs through its powerful speakers. The comfortable earplugs along with its in-ear design, additionally assure that outside noise will be blocked from coming in – letting you enjoy your tracks to the absolute most. With a cable length of 1.25m, the Mi headset can be efficiently used with your tablet, laptop, or smartphone – no matter whether you’re at home or on the go. No matter where you are at, with these remarkable headphones you’ll always be able to enjoy those all-time classics in breathtaking audio quality and engage in hands-free phone calls. The Xiaomi Mi In-Ear Headphone Pro comes with a 12 months warranty, brought to you by the leader in electronic devices as well as wholesale electronic gadgets..
Arabic: - سماعات - Chinese Simplified: - 耳机 - Czech: - Sluchátka - Danish: - Øretelefoner - Dutch: - Oortelefoons - French: - Écouteurs - German: - Kopfhörer - Hebrew: - אוזניות - Hindi: - इयरफ़ोन - Italian: - Auricolari - Japanese: - イヤホン - Korean: - 이어폰 - Malay: - Telinga - Norwegian Bokmål: - Øretelefoner - Romanian: - Căşti - Russian: - Наушники - Spanish: - Auriculares - Thai: - หูฟัง - Turkish: - Kulaklık - Vietnamese: - Tai nghe.